Felwood is a land filled with valuable resources as well as demons and other corrupt creatures. Getting there can be tedious, but worth it. Of particular interest in Felwood are the special corrupted plants, which can be harvested using the Cenarion Beacon and Cenarion Plant Salve. To obtain these quest items, you must first complete the prerequisite Cleansing Felwood quest given by Arathandris Silversky in Felwood. She can be found standing by herself, next to a tree, a short distance to the southeast of Emerald Sanctuary. Night Dragon's Breath: Restores 394 to 456 mana and 394 to 456 health. Most importantly, they're not on the same timer as healing potions. Songflower Serenade: Increases chance for a critical hit by 5% and all attributes by 15 for 1 hour. Whipper Root Tuber: Restores 700 to 900 health. Most importantly, they're not on the same timer as healing potions. Windblossom Berries: Restores 1933 health over 27 sec. Must remain seated while eating. Also increases your Stamina by 10 for 10 min. This effect stacks with other Stamina buffs and is instantaneous, so you don't have to sit there for 10 seconds for it to take effect. These items are quite useful, because the Windblossom Berries provide you with a free source of food and Stamina buff while the Whipper Root Tubers and Night Dragon's Breath give you additional healing capabilities on a timer independant from healing potions. To simplify the use of these various healing items, I've created a handy macro. I use this macro to heal myself with two different healing items, all by clicking a single button multiple times. I usually carry Major Healing Potions in my main bag, slots 1-3, and Whipper Root Tubers in slot 4. Night Dragon's Breath, Crystal Restores and Warlock's Healthstones can also be used for this purpose, however as of the 1.10 patch, they all share the same 2 minute cooldown as the Whipper Root Tubers. Change the slot locations to fit the locations of your own healing items. In this particular macro, I've placed my healing items in slots 1-4 of bag #0, my main backpack. To count bags, go from right to left (0-5), and to count slots, go from left to right, top to bottom. After creating the macro, bind it to one of your action bars and/or to a button on your keyboard. Whipper Root Tubers and Night Dragon's Breath both stack in groups of 20, which makes them very space efficient. 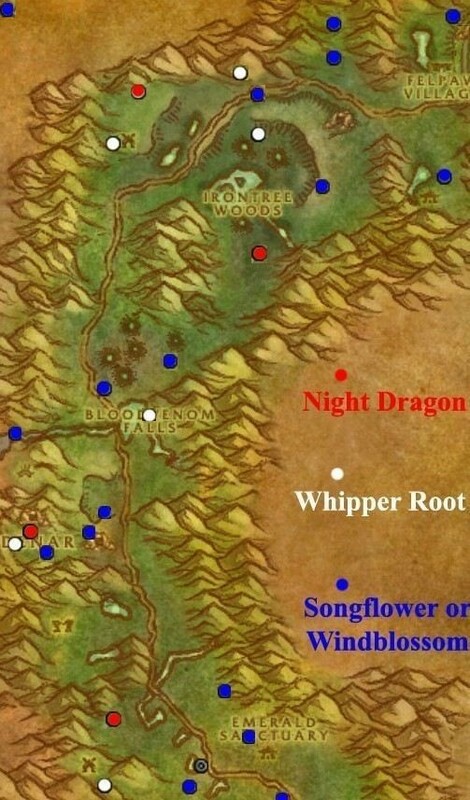 When harvesting from the corrupted plants, Whipper Root Tuber and Night Dragon's Breath plants will yield about 3-6 reward items per cleansing. Windblossom Berries plants can yield up to 20 berries per cleansing. Songflower Serenade is a one time instant effect that buffs you for an hour. 1. Active and corrupted. Click on the plant to clean it. Then click on it again to collect the reward items. 2. Active and cleansed. Either somebody cleansed the plant and forgot to collect the reward items, or the plant spawned pre-cleansed. Click on it to collect the reward items. 3. Inactive. The plant has already been cleansed and harvested. You can see the plant, but cannot interact with it. Come back later. 4. Invisible. The plant has disappeared after being inactive for a while. Come back soon. To help find these plants, I have modified and improved a map originally created by cocodapuf, plotting the locations of the various plants.